The garden is increasingly seen as an extension of the house. As soon as the weather allows it people live outside as much as possible. But the English weather can still sometimes throw a spanner in the works. A outdoor fireplace or patio heater can provide a pleasant and warm terrace. This allows you to enjoy your garden and terrace more and for much longer. The outdoor season will be considerably longer with a patio fireplace. Terrace fireplaces are ideal if you want to enjoy a long and warm evening outside. If it cools down, it will be very nice to light the fireplace. You will not only enjoy a pleasant warmth, but also an unprecedented atmosphere. You will find patio fireplaces in many versions: large, small, round, square, with grill grid, with wood storage or without. In addition to the black steel terrace fireplaces, you also have the choice of corten steel fireplaces. Corten steel fireplaces will eventually obtain a beautiful rusty color. You will find a huge range of garden gardens at Firepit-online.com. At present we have over 140 different models in stock. Our range includes terrace fireplaces of appealing brands such as Burni, Gardenmaxx and Esschert. Brands that stand for quality. Gardenmaxx, for example, has fireplaces made of 1.6 or 2 mm thick steel. Many models are available in both a small version and a XL version. Smaller models, such as the Gardenmaxx terrace fireplace Vilos, have an average height of 120 cm. The height of the larger model garden fireplaces can range from 1.50 to 2 meters. An example of a large garden, for example, is the Chacana Black XL terrace fireplace or the patio fireplace Pinacate. Burni terrace fireplaces are robust timeless fireplaces that are ideal for placement under a veranda and can be expanded with practical accessories such as a barbecue grill, stoves and double-walled roofing. All these accessories are of course available at Firepit-online.com. The fireplaces are made of as much as 3 mm thick steel. 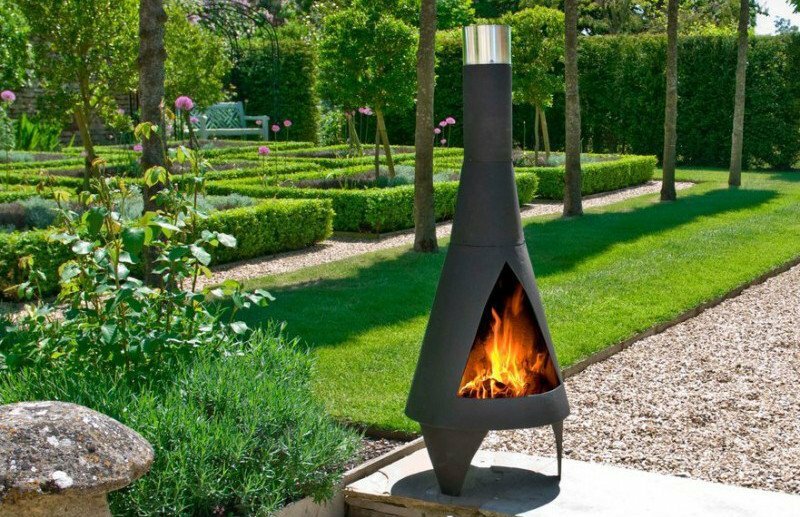 A widely sold model is, for example, the Burni Stig patio fireplace.